In our busy lives, time is often considered our most valuable commodity. There’s never enough of it, and we are constantly trying to decide how to spend it wisely. 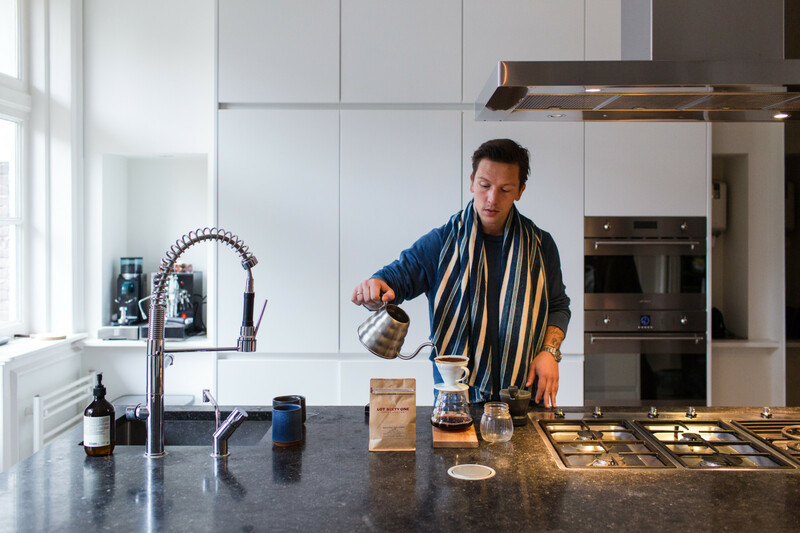 It’s precisely the element of time that drives Menno van Meurs, co-founder of Amsterdam-based denim brand Tenue de Nîmes. 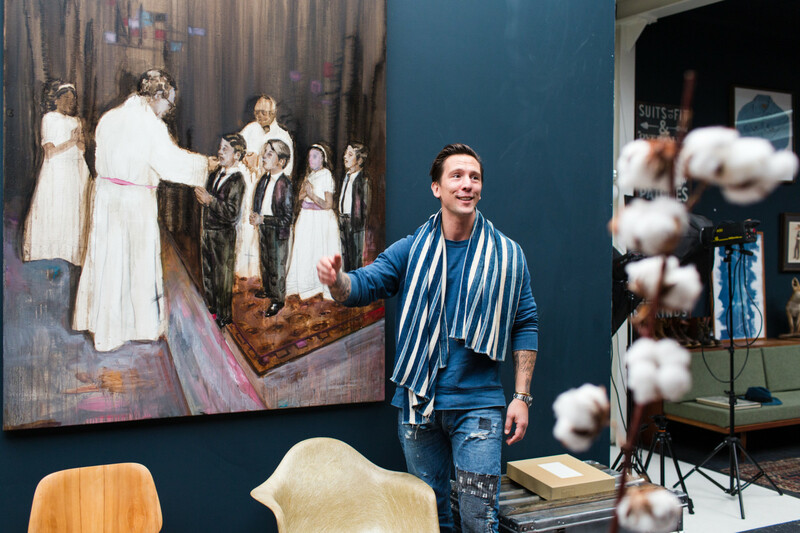 From jeans to vintage Eames chairs, slow drip coffee to suede Red Wing boots, Menno embraces “the good things in life.” It’s no coincidence that all of these objects take time to make — and that they’re crafted to last. When stepping into Tenue de Nîmes’ studio space in the west of Amsterdam, it feels like time stops. Warm chestnut mid-century cabinets host Japanese dolls, whiskey bottles, and spools of colored yarn; stuffed foxes peek out from behind piles of jeans; and 1950s jackets are hung like pieces of art on blue walls. Everything in the room demands your attention as every piece has a story to tell. Together, the objects form a timeless harmony that can only be identified as Tenue de Nîmes. This portrait is part of our ongoing series with Vitra. Visit Vitra Magazine to find out more about Menno’s approach to interior decoration. When did you realize you wanted to work in retail? I was 15 years old. I thought working in retail was one of the coolest things you could do. I was obsessed with sports at the time and used to take the train to this one sports shop in Rotterdam almost every weekend. I was there so often that the manager eventually offered me a job. I guess you could say I was hooked from then on. At 17, I started working at a jeans store which opened my eyes to the incredible world of denim. Even though I was studying sports and economics at the time, I was happiest when working at the shop. I always made sure I was up in time to open the doors at 9am, even if I had been out the night before until the early morning. When I finished my studies I knew I wanted to get back into retail but found it hard to explain to people. With a business degree you’re expected to buy a suit and start your career at a corporate office but that was the last thing on my mind. I needed some time to accept that working in retail was what I truly wanted to do with my life. I was living with a good friend of mine at the time, Edson Williams, who used to run a photography agency in the city. He hooked me up with an internship at the creative agency …,staat where I could see first hand what it took to start something from scratch. It was incredibly inspiring and exactly what I needed to stand on my own feet. It was there that I met Tenue de Nîmes’ art director Joachim Baan. Let’s talk about Tenue de Nîmes. What made you decide to open a denim shop? I actually met Rene Strolenberg, Tenue de Nîmes’ co-founder, when I was 17 and working at that jeans shop in The Hague – he was working at the Amsterdam branch. We became friends and decided to change the world together – that’s what you do when you’re 17, right? When we ran into each other after all those years we remembered that crazy dream we once had. I shared my thoughts about opening my own store, and Rene, who was working at G-Star at the time, jumped on board. We both developed a true passion for denim while working at the jeans shop as kids. We realized that there wasn’t a place where everyone could purchase jeans – from your mom to a super stylish 18-year-old guy and everyone in between. We decided to focus on that: denim for all. Tenue de Nîmes is much more than a denim store. Was that always the idea? I recently talked to Rene about this and we had a good laugh. When we started out we didn’t actually know a lot about retail. We knew what felt right to us and had picked up a thing or two while working in the industry as kids. Before we knew it, we were running into other idiots like us (laughs). I don’t mean this in a negative way, actually the opposite. We started meeting all these crazy people who shared our passion for indigo and denim, but also for leather goods and cosmetics and jewelry. Tenue de Nîmes has progressed quite organically from a purist jeans store to a warehouse of beautiful products, brands and concepts. And these are the people you feature in Journal de Nîmes, right? Yes, exactly. When we started out we thought sending a press release would be too boring — so we turned things around. We created a magazine about who we were, what we were going to do with Tenue de Nîmes, and included the stories of people who inspired us – like Mr. Manabe from Japan and Mr. Olson from Sweden. Within a month, the magazine had been read more than 20,000 times. That’s when we decided to make the Journal a regular thing — to continue sharing stories about the many interesting people we met as well as the bizarre things we read about and experienced. There’s such a defined aesthetic to Tenue de Nîmes – you really feel it once you step inside. How did you manage to achieve that? It’s actually quite fashionable these days to salvage vintage objects and furniture. But honestly, when we started out, we didn’t have a lot of money and salvaging things we liked was all we could afford. When we were setting up our first store on the Elandsgracht, we were on a very limited budget and, as a result, left a lot of the historical building intact. At one point the contractor wanted to knock all these old tiles off from a pillar in the middle of the space but we wouldn’t let him. Now it’s an icon in the store. I guess you could say that we believe things are beautiful as they are. We celebrate the good things in life. With the store, we want to show people how many beautiful pieces can actually stand the test of time. I always think of that Patek Philippe motto, “You never really own a Patek Philippe, you just borrow it for a while.” When you look at the origins of jeans, why jeans were made in the first place, it’s quite incredible; they weren’t made to be beautiful, they were functional and made to last. Jeans were supposed to facilitate lives, to ensure that people performed better. The story of Tenue de Nîmes will always be related to jeans; it’s a mirror through which we look at ourselves – where are we, what do we want to do, what should we be doing? Would you say that’s the reason for your success? We’ve tried to find a good mix between old-school retail and the new world. Old-school retail is about knowing your product, providing good service and believing in the products you sell. Our society has forgotten that. People say that we go out of our way for our customers, but we just think we’re providing good service. The fact that we shorten the length of your newly purchased jeans for no extra cost while you wait with a warm cup of a coffee is because we believe that your jeans should fit you the way you want them to. When you buy a car, you don’t have to buy the wheels separately – no, you drive out of the garage with exactly the car you need. So that’s one thing. Then on the other hand, we live in strange times. We no longer communicate with people who live in Amsterdam alone, but with the whole world – that’s an exciting development for the retail industry. That combination between old-school retail and the Internet-driven new world is essential. 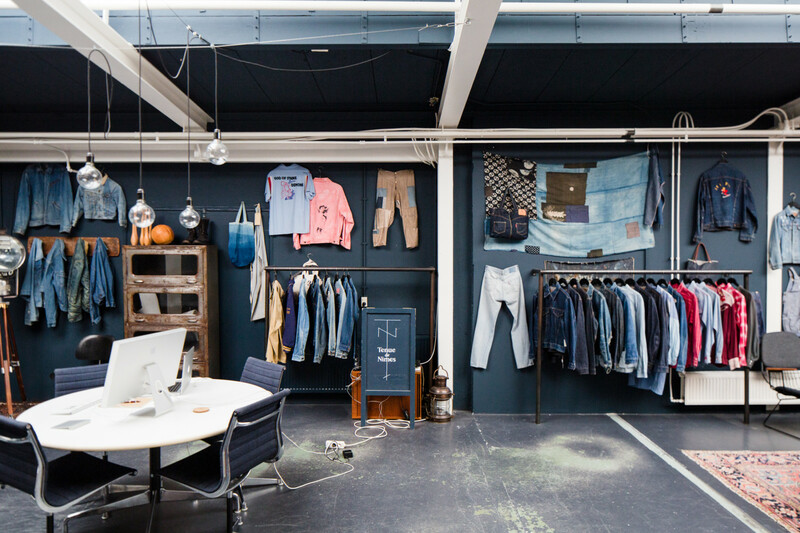 Do you think it has helped that there is so much happening in the denim industry in Amsterdam? I always have to laugh when people say, “Amsterdam, the denim city.” Yes, Amsterdam is an incredibly cool ‘brand’, and we think it’s interesting and important to be a part of that. And yes, it’s true that several important denim brands are based in Amsterdam, adding to the ‘denim momentum’, if you will. Another interesting fact is that in the Netherlands, we own more jeans per person than any other country. We just love denim. So it’s not crazy that a brand like G-Star is from the Netherlands. So yes, I’m very happy that many people around the world consider Amsterdam a denim carrier, but I think we still have a lot to learn. Luckily there’s a jeans school now, an initiative of the House of Denim. With these kinds of initiatives, we’re on the way to become more proficient with regard to denim. There’s definitely a similar aesthetic between the stores, studio and your home. Would you agree? It’s not something I planned. Everything you see comes from the heart. What you see in my home is a strange collection of things I find fascinating. 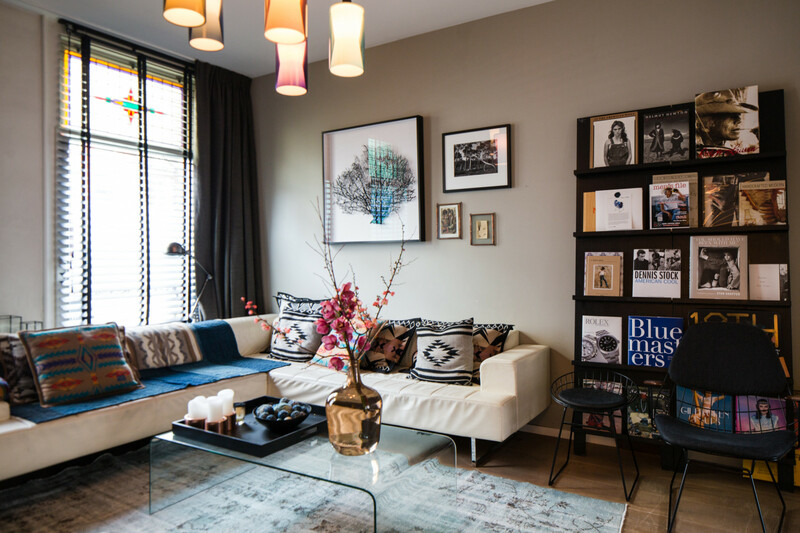 And you could say it mirrors my interests – from American vintage and the heritage of jeans to contemporary art and sleek Scandinavian design. I try to surround myself with beautiful items. I don’t have much time, I work very hard and spend as much time as I can with my family, so it’s important to surround myself with objects that bring me joy. I feel like we keep touching on this aspect of time. Ralph Lauren once said that things made for a specific function must get better with age. I believe you should invest in things that last because that way, you can enjoy them your whole life. That’s definitely true of furniture – a brand new leather sofa is nowhere as beautiful as a 20-year-old one. The same can be said of clothing. Everyone is so concerned with fast fashion that we decided to go slower and slower and then some. Haider Ackermann said that he makes clothes to help people lose all sense of time. Time, he said, is the ultimate luxury. When I heard that I thought, that’s genius. I want to make people think about the most scarce thing we have in life, time. When people enter our stores, I want them to lose all sense of time. I serve them a nice coffee and encourage them to relax, to enjoy the moment. On a product level, in addition to offering great denim brands, we focus on defining the perfect basic. Because at the end of the day, we don’t actually need that much. Buy less, pay more. Menno, thanks for sharing both your love of denim and your philosophy on time with us. Get into Menno’s world and have a look at what Tenue de Nîmes is all about. Here at FvF, we have a special bond with the Dutch capital – discover more stories from Amsterdam. Also check out the endless array of designers we’ve met over the years.